1. "Hey, I was in X country and the price was cheaper/more expensive!" Yes, prices vary dramatically across nearly every country. When we compiled this data we were seeking out numbers that best represented the most common price in a particular country. For instance, in Saudi Arabia, you can pay $15 U.S for access if you want, but you can also find places who offer it for $3. 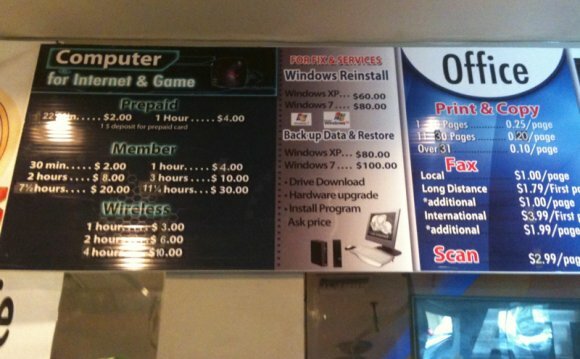 These numbers are in no way meant to accuraly represent every price of every internet cafe in every country. 2. What do the grey areas represent? Aren't there more countries with high poverty levels? Grey countries were not included in this survey. Data may have existed for them, but this was originally published in print, and we had a limted amount of space. And yes, many, many other countries live on less than $1 per day. We simply picked a representative sampling. 3. Why do people who live on $1 per day need to worry about internet access? Good question. First of all, don't literally think of "$1 per day" to mean just that. The point of this exercise was to show that Cafe prices don't often serve their local populations, due to the fact that they're too expensive. The $1 figure is simply an effective way to point out countries with large populations of people living in poverty. Why do poor people need the internet? Well, often the internet is considered to be a great democratizing and equalizing force. The people who most need equalizing are people who live in poverty. If they can't afford to get on the internet, then how is it improving their lives? Maybe through indirect means? In any case, our goal was simply to inspire people to ask questions like these. We seem to have been successful. Thanks for your comments!